Revenue from textile segment was Rs . 916 Cr in n Q3FY17 against Rs. 704 Cr in the Q3 of FY 16 giving a YoY growth of 30%. EBT was higher by 11% at Rs. 83 Cr and EBT margin was at 9.1%. EBT of textile increased by 26% to Rs. 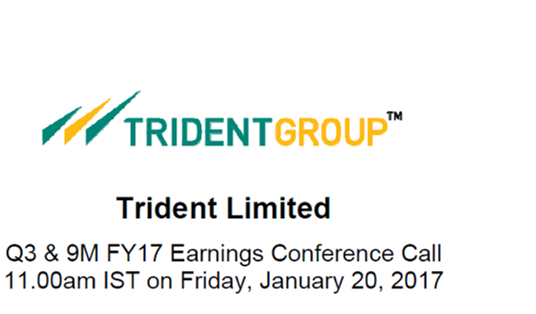 291 Cr while the EBITDA margin was 10.2%. The revenue were higher by 11% at Rs . 223 Cr compared to Rs. 201 Cr in Q3 of FY 1 6. In paper size the increase in realisation on YoY is 4%. QoQ will be around 1.5-2%. Overall EBT increased sharply by 62% at Rs. 63 Cr translating the EBT margin at 28.4% which is higher by 890 basis point YoY. This was due to better realisation of paper products and higher valuation of paper products. In the paper segment the revenues were up by 5% to Rs. 650 Cr . Trident was conferred with runner-up award of prestigious PMI India award 2016, for its integrated textile project at MP. Several awards for energy conservation such as award of National Energy Conservation award 2016 by ministry of power, Govt of India. Out of total revenue 49% of revenue is from bath & bed both, and around 19% is from paper and 34% is from yarn . The team appointed in US and UK both is doing well. And in last 9 months the team has as shown a good growth in terms of order book and pipeline and visibility, towel volume has been increased by 20%. About 65-70 % export is in US and 15%-20% is in Europe. Average cost of the TUF loan is less than 3%. In bed linen, the utilization has gone down and is about 27% in this Quarter against 32% in previous Quarter. In FY 18 company is planning to repay Rs. 400 Cr of debts.The payments will be done by free cash flows. In last 2 years the margin in yarn was between 12% -20% and now, the range is between 15% -22%. In towels the margin is 20-24% due to marketing and US clients. In bed linen they have not even reached breakeven yet. Breakeven is expected in Q4. Decline in EBITDA margin was due to two reasons firstly, the increase in the raw material cost which is cotton, cost of cotton in Q2 was less than the cost of cotton in Q3. Secondly, in this Quarter. the company had a MTM forex of about Rs. 8 Cr like contracts of exports. In towels there is decline in the utilization and was at 46% in the quarter . and in Q2 was 58%. In yarn 45 days is the lead time and cotton prices are increasing so, proportionately the price will increase . Company procures cotton between month of October to March and in yarn there is 45 days lead time and in towel there is 3 months lead time . In Q3FY17, the ratio of processed and unprocessed cotton is 90:10. Capex maintenance will be around Rs. 50-55 Cr in a year. Expansion in Europe and US, penetration in these market and offices are open in Europe to take care of the market. No of customers for bed linen was 5 in Q3FY17, out of which 2 are big customers. India has an inherent advantage in cotton and that will be kept in consideration while preparing import regulations by US. New notification of rebate of Ministry of textile on exports. Effects of 3.5% of duty from the govt notification. It completely depends on price & demand. FY18 will be good for the paper (writing, printing & copier ).Import from Indonesia is in writing and printing. Cotton production is expected to be increased and cotton prices also hiked and reached to 42000 per candy, in December the rates was 40000 per candy. Only bed linen has been increased to 15% and other as similar to last quarter. 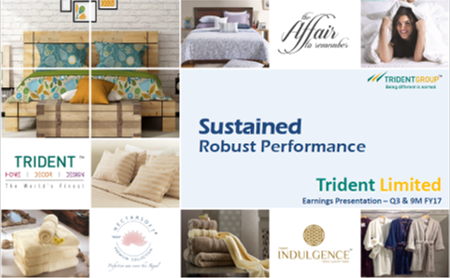 Capacity Utilization of Bed Linen facility was 29% in 9M FY17, while the utilization in Bath Linen stood at 49% based on tonnage capacity. Yarn business also reported improved utilization level of 92%. in Bed Linen, the utilizations are lower. It is at 27% in this quarter as against 32% in the previous quarter which is Q2. However, 60% was processed and 40% was non quarter. The proportion is 90-10 in Q3FY17, and so realizations are going to improve. Towel segment capacity is 90000 ton details.The segment is given as of maximum rated limit and at normal capacity it will be around 75-80% can be achieved.India is more competitive than china in towel and cotton. The capacity in paper is around 1 lakh 75 thousand ton per annum and utilization is 90%. Cotton procurement prices/ hand textile fair response. Average cotton prices are around 42000 per candy. The yield in cotton per hectare has been increased. Patents always showcase the customers as a USP and they look as a different Product and it keep the company ahead from the other compet it ors. Company will increase the copier paper segment. The company topline will grow by 20% in FY 18. The proportion of Indian products is increasing at 10% CAGR YoY.